Here are 6 delicious recipes to get you started. 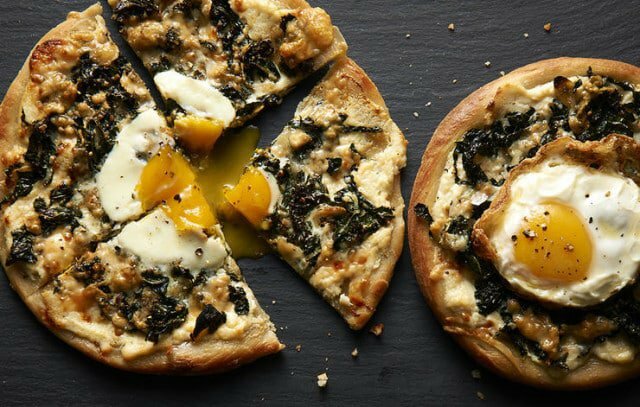 When you go beyond the basic cheese-and-sauce combo, pizza can be a sneaky (and delicious!) way to get all five food groups onto your plate. First, the crust: Divide a 500-gram ball of pizza dough in 4 and let sit at room temperature for 20 to 30 minutes. Heat oven to 230 degrees. Heat a pizza stone or overturned baking sheet in the oven. With your fingers, stretch dough balls to 20cm rounds. If dough shrinks, cover with a dish towel, let rest another 10 minutes, and try stretching again. Transfer rounds to a parchment paper-lined cutting board, and add toppings. When ready to bake, transfer parchment onto cooking surface and bake pizzas on parchment. The paper will get dark but won’t burn. Each recipe makes 4 personal pizzas. Clams are packed with omega-3 fatty acids and iron. In a skillet over medium heat, add 1 Tbsp. olive oil and 1 minced clove garlic. Add ½ small bunch stemmed and chopped kale and ¼ cup bottled clam juice and cook, stirring, until kale is wilted, about 5 minutes. Add ½ cup chopped clams, 2 Tbsp. lemon juice, and 1 Tbsp. white wine, and cook another 5 minutes. Divide and spread mixture over crusts, bake 5 minutes, and remove. Then divide ¼ cup grated Parmigiano-Reggiano cheese and sprinkle on pizzas. Bake until crust is golden, 5 to 7 minutes more. While high in salt, pecorino cheese has conjugated linoleic acid, an omega-6 fatty acid that preserves muscle tissue. 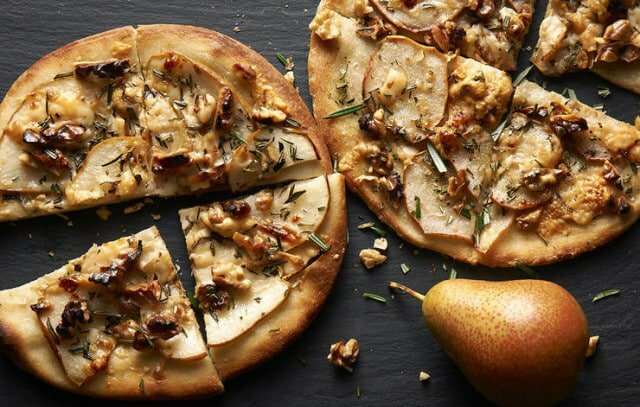 Top pizzas with 1 thinly sliced pear, 115 grams shaved pecorino cheese, and ¼ cup chopped walnuts. Season with 1 tsp. chopped fresh rosemary leaves, a pinch of salt, and a drizzle of extra-virgin olive oil. Bake until crust is golden, about 12 minutes. White beans are high in protein and fibre. In a skillet, cook 85 grams pancetta cut into 0.5cm strips in 2 Tbsp. olive oil until crisp; transfer to a plate. Add 1 minced clove garlic and ½ tsp. chopped fresh rosemary to the skillet, stirring until fragrant. Stir in 2 cans drained and rinsed no-salt-added cannellini beans, and mash. Stir in pancetta. Drizzle olive oil over pizzas and spread bean mixture evenly over crusts. Top with 115 grams thinly sliced gouda cheese and bake until the crust is golden, about 12 minutes. Top with fresh baby arugula. Some brands of crème fraîche have probiotics to support digestion (look for “live and active cultures” on the label). Divide and spread ½ cup crème fraîche on pizzas. Tear bite-size pieces of fresh mozzarella totalling 225 grams and top pizzas. 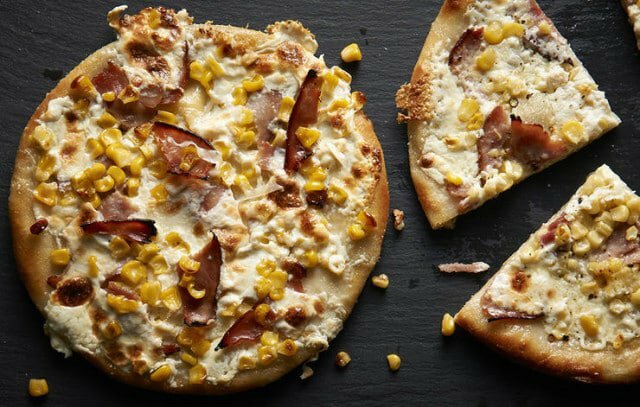 Cut 4 slices of ham into thin pieces and add to each pie along with corn kernels from 1 cob. Bake until crust is golden, about 12 minutes. Beets are a good source of potassium for muscle function. Slice 3 beets (any variety), 1 bulb fennel, and 2 peeled blood oranges; drizzle with extra-virgin olive oil and roast at 210 degrees until tender, 25 minutes. Increase heat to 230 degrees. 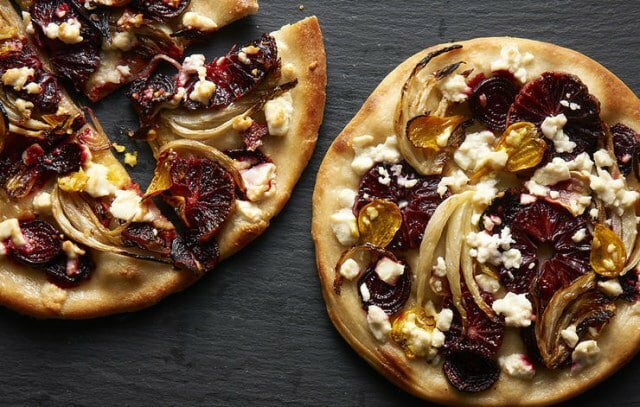 Divide veggies among pizzas, top with 170 grams crumbled feta cheese, and bake until crust is golden, about 12 minutes. 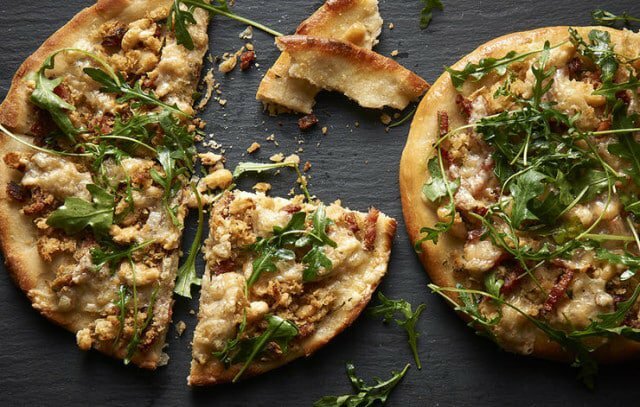 Sneak in these omega 3- and protein-rich fish by cooking them into your pizza. Heat 3 or 4 anchovy fillets in a skillet with 1 Tbsp. olive oil, breaking up with a spoon until melted into the oil. Add 1 sliced clove garlic and 1 bunch stemmed and sliced kale; stir until wilted, about 5 minutes. Bake pizza crusts for 4 minutes. 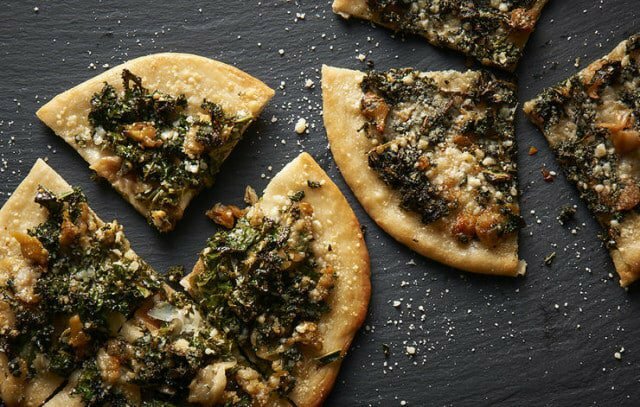 Divide and spread pizzas with ½ cup part-skim ricotta, top with wilted greens, and sprinkle on ½ cup shaved Parmigiano-Reggiano cheese. Bake until crust is just golden, about 5 minutes more. Crack 1 egg into center of each pizza and return to oven until whites are cooked through, about 5 minutes. Should You Eat Before A Workout? 8 Reasons You’re Not Losing Weight! Want To Run A Faster 5K? Eat Enough Protein!